We are gathered on the auspicious occasion of Sri Govardhana-puja at the feet of Sri Giriraja Govardhana. Many of you may know the history, related in Srimad-Bhagavatam: One day Sri Krishna noticed that the cowherd men were collecting paraphernalia for worship. As the omniscient Supersoul, the Lord already understood the whole situation. Still, as a matter of etiquette, He humbly inquired from His elders, headed by Nanda Maharaja, what their purpose was. He said that no secrets should be kept by saintly persons, and certainly not from friends and relatives. Nanda Maharaja answered that the paraphernalia was being gathered for the worship of King Indra, because King Indra sends rains that sustain all creatures. 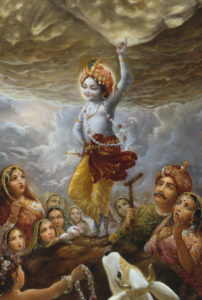 Krishna proceeded to give many arguments against the Indra-yajna, and although many of the arguments came in the category of Karma-mimamsa, which is not really the philosophy of Srimad-Bhagavatam or Krishna consciousness, Krishna put them forward just to stop the impending sacrifice and curb Indra’s false pride. Then Lord Krishna proposed that the paraphernalia for the worship of Indra be used for the worship of the cows, the brahmans, and Govardhana Hill. And as will be revealed later in the pastime, Krishna demonstrated that Govardhana Hill was actually Krishna Himself. Now I shall read a few verses from Srimad-Bhagavatam in which Lord Krishna explains the worship of Govardhana Hill that He wanted the Vraja-vasis to perform. Lord Krsna here points out that the residents of Vrndavana should recognize their relationship with Govardhana Hill and with the forests of Vrndavana, and not worry about a distant demigod like Indra. Having concluded His argument, Lord Krsna makes a radical proposal in the following verse. Indra is one of the powerful demigods. The Bhagavad-gita, Srimad-Bhagavatam, and other scriptures explain that there is one Supreme Lord, Krishna (isvarah paramah krsnah), but that He has many powerful servants whom He entrusts with the management of different universal affairs. Thus, Krishna is like the king and the demigods are like His ministers. As in the ordinary world there is a minister or secretary in charge of energy, so there are demigods in charge of various necessities of life. For example, Indra is in charge of the rain, Vayu is in charge of the air, and Varuna is in charge of the waters. The goddess Sarasvati is in charge of knowledge and culture and music. And on another level, Brahma is in charge of creation, and Shiva is in charge of destruction. These different demigods are servants of Krishna, just as ministers are servants of the king. If we pray to a demigod or worship a demigod, he may give us some material boon, but in the Bhagavad-gita Lord Krishna says that such worship is avidhi-purvakam, not proper, and that such worship is actually meant for Him. Because Krishna is in the heart of every living entity, He is also in the hearts of all the demigods. So even if we pray to a demigod, the demigod has no power to grant the prayer without the sanction of Krishna within the heart. In other words, the demigods are not independent. When we chant the holy name, we’re advised to avoid certain offenses (nama-aparadhas). The first is to blaspheme the devotees who have dedicated their lives for propagating the holy name. And another offense is to consider the names of demigods, even the most powerful ones such as Lord Brahma and Lord Shiva, to be equal to or independent of the names of Lord Vishnu. So, the demigods are not equal to Krishna, or Vishnu, and they’re not independent of Him. If we think that they are on the same level, we are involved in committing an offense. And if we commit offenses when we chant the holy name, we don’t get the result that we’re meant to get from chanting. Generally, impersonalists think that the demigods are equal to Krishna; they think that the Supreme ultimately is impersonal and that the same impersonal One comes in various forms—as Vishnu, Shiva, Surya, Durga, or Ganesh. And they say that ultimately one has to go beyond these different forms to merge and become one with the impersonal God, or Brahman. But devotees find such a proposal to be repugnant, because the life and bliss of a devotee come in serving the Lord. If the devotee were to merge and become one with the effulgence of God, then where would be the chance for service? Therefore, great devotees pray that they would rather live in hell than merge into the brahmajyoti, because at least in hell they can serve and glorify Krishna, which is their real happiness and life. So, whether one is an impersonalist who thinks that we are actually meant to go beyond the different forms and merge into and become one with the impersonal effulgence of God, or whether one is just an ordinary materialist who thinks that there are many equal gods who bestow different benedictions and that according to the particular benediction one wants, one can choose a particular god to worship and get the result, the fact remains the same: Krishna is the Supreme Godhead, and all others are His servants (ekale isvara krsna, ara saba bhrtya [Cc Adi 5.142]). Pure devotees have no desire to gain any material reward for their worship. They just want to serve Krishna in love, for His pleasure. And the happiness they get from such pure devotional service far exceeds—by millions and trillions of times—even the happiness that one can get from impersonal liberation, what to speak of the insignificant happiness one can get from material facilities in this world of death. So, devotees simply want to serve Krishna in love, and the residents of Vrindavan agreed to worship Govardhana Hill not because of all the arguments that Krishna gave, but because of their love for Him. As mentioned, Krishna’s arguments were really meant to provoke Indra and ultimately to curb his false pride. Otherwise, the devotees of Vrindavan were so in love with Krishna that they would do whatever He wanted just to please Him, out of love. No other reason was required. And that is the specific qualification of the devotees of Vrindavan: they love Krishna naturally and spontaneously, not because He is God. They do not place any condition, that if Krishna is God we will love Him but if He is not God we will not love Him. They don’t even bother about whether He’s God or not. They just love Him as the beautiful son of Nanda and Yasoda, and just to please Him they are ready to do whatever He wants. Therefore may a sacrifice for the pleasure of the cows, the brahmanas, and Govardhana Hill begin! With all the paraphernalia collected for worshiping Indra, let this sacrifice be performed instead. Lord Krsna is famous as go-brahmana-hita, the well-wishing friend of the cows and the brahmanas. Lord Krsna specifically included the local brahmanas in His proposal because He is always devoted to those who are devoted to the godly Vedic culture. The latter verse describes Krishna as the master of the cowherd men (gopas) and the lover of the cowherd girls (gopis), especially Srimati Radharani. That is our goal—to serve Krishna, the lover of Srimati Radharani and the gopis and lord of all the residents of Vrindavan. But how do we achieve such pure devotional service? In Vedic society the brahminical culture serves to gradually elevate the conditioned souls to that stage of perfect God consciousness. Thus, the worship of the brahmans is important, because the brahmans teach us Vedic knowledge for God realization. They study and teach shastra. Tasmad gurum prapadyeta jijnasuh sreyah uttamam: when one is actually interested in one’s ultimate benefit, one should approach a spiritual master, the best of the brahmans. He teaches the Vedic literatures, he lives by the Vedic literatures, and he instructs his students to do the same. In the Bhagavad-gita Lord Krishna specifically instructs us to protect the cows (go-raksya). The cows are important because they give milk, and from the milk we make ghee and with the ghee we can perform Vedic sacrifices. But even more important than Vedic sacrifices, with the ghee and other milk products we can make offerings to Giriraja and Giridhari and thus advance in Krishna consciousness directly. So, the cows and brahmans are important in Krishna consciousness. Let many different kinds of food be cooked, from sweet rice to vegetable soups! Many kinds of fancy cakes, both baked and fried, should be prepared. And all the available milk products should be taken for this sacrifice. The word supa indicates bean broth and also liquid vegetables. Thus to celebrate the Govardhana-puja Lord Krsna called for hot preparations such as soup, cold preparations like sweet rice, and all types of milk products. Many of the cooks in the audience may have found that the preparations they made today for offering to Giri Govardhana are included in Lord Krishna’s list. Actually, the Vraja-vasis brought huge quantities of food to offer to Govardhana Hill, and Govardhana ate all of them. 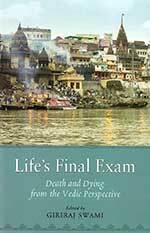 The brahmanas who are learned in the Vedic mantras must properly invoke the sacrificial fires. Then you should feed the priests with nicely prepared food and reward them with cows and other gifts. According to Srila Sridhara Svami, Lord Sri Krsna instructed His father and other residents of Vrndavana in the technical details of this Vedic sacrifice to assure the quality of the sacrifice and also to inspire Nanda and the others with faith in the concept of such a sacrifice. Thus the Lord mentioned that there must be orthodox brahmanas, regular sacrificial fires, and proper distribution of charity. And things were to be done in the order given by the Lord. After giving the appropriate food to everyone else, including such fallen souls as dogs and dog-eaters, you should give grass to the cows and then present your respectful offerings to Govardhana Hill. After everyone has eaten to his satisfaction, you should all dress and decorate yourselves handsomely, smear your bodies with sandalwood paste, and then circumambulate the cows, the brahmanas, the sacrificial fires, and Govardhana Hill. Lord Krsna wanted all the human beings and even the animals to eat nice bhagavat-prasada, sanctified foods offered to the Lord. To enthuse His relatives with a festive mood, He requested them to dress beautifully with fine clothes and ornaments and to refresh their bodies with luxurious sandalwood paste. The essential activity, however, was the circumambulation of the holy brahmanas, cows, sacrificial fires, and especially Govardhana Hill. This is My idea, O father, and you may carry it out if it appeals to you. Such a sacrifice will be very dear to the cows, the brahmanas, and Govardhana Hill, and also to Me. In accordance with the request of Sri Krishna, the Vraja-vasis prepared varieties of foodstuffs and brought them to offer to Govardhana Hill. It is described that lakes—literally lakes—were filled with sweet rice, rabri, and other nectarean liquid preparations, and that the Vraja-vasis offered literally mountains of rice, pakoras, puris, halava, laddus, and other preparations that, from the smiles on your faces, you seem to know about already! Then Krishna assumed an unprecedented, gigantic form, and He stood atop Govardhana Hill and declared, “I am Govardhana Mountain!”, showing the superiority of His Govardhana-puja over the Indra-yajna. For so many years, the Vraja-vasis had performed the Indra-yajna, but had Indra ever appeared personally to bless them? Now they had performed the Govardhana-puja only once, and Giri Govardhana had manifested Himself in person to fulfill their desires. The Vraja-vasis were completely bewildered. They didn’t know what to do. There was not a single grain left in Vraja that they could offer. Finally, someone had the idea to offer Krishna tulasi leaves—the one thing they hadn’t offered—so the brahmans offered Govardhana tulasi leaves. Then, to the relief of all the Vraja-vasis, He said, “Trpto ’smi! I am satisfied! Trpto ’smi! I am satisfied!” Thus the Vraja-vasis were pleased and relieved that they had satisfied the Lord. The only problem was that there was not a grain left to eat in all of Vraja. There was not a drop of milk that they or their elders or children could drink. Then the merciful Lord returned all the food He had eaten. Miraculously, all the empty lakes filled up with sweet rice and various nectars and all the mountains of samosas and sandesa reappeared, and the Vraja-vasis had a huge feast of krsna-prasada. Today we are trying to re-create the same festive mood and the same type of worship of Govardhana Hill, who is Krishna Himself, by circumambulating Him, singing His glories (always the most important item), bathing Him, offering Him various kinds of food preparations, and in the end, honoring His remnants. The Srimad-Bhagavatam tells us that the original, small Krishna, along with the other Vraja-vasis, bowed down to the unprecedented, huge form of Krishna, who stood atop Govardhana Hill, and thus, in effect, Krishna offered obeisances to Himself. In his Krsna book, the summary study of the Tenth Canto of the Srimad-Bhagavatam, Srila Prabhupada writes, “The identity of Krsna and Govardhana Hill is still honored, and great devotees take rocks from Govardhana Hill and worship them exactly as they worship the Deity of Krsna in the temples.” And that we have here. That very principle is being followed in this temple, and so we worship the large rock from Govardhana Hill just as we worship the other Deities of Lord Krishna here—as Krishna Himself. We should not take such worship cheaply. I have heard of life members and friends who have gone to India, to Govardhana Hill, and filled up their purses and shopping bags with stones (silas). But actually, govardhana-silas are not so cheap. First of all, the shastras say that whatever the weight of the stone that you take from Govardhana Hill, you should leave the equal weight in gold. (From the audience’s reaction, we need not go beyond even this first condition.) Even then, there are other procedures: one must receive the sila from a Vraja-vasi, and so on. But here we are fortunate to have a large govardhana-sila to worship and serve. So, the festival was conducted very nicely, and everyone was happy, because when Krishna is satisfied everyone is satisfied. But one person wasn’t satisfied, because his Krishna consciousness had been covered by his false pride, and that was King Indra. He felt offended that his worship had been stopped and the paraphernalia for his worship used for the Govardhana-puja. So he became angry and sent devastating rainfall upon Vrindavan. He summoned his special clouds of destruction, known as Samvartaka, who flood the universe in the end, and ordered them to attack Vrindavan. And he followed them with swift and powerful wind-gods to decimate the cowherd village of Nanda. Thus Lord Krishna, to give protection to the residents of Vrindavan, lifted Govardhana Hill and held it over His head like an umbrella. And He invited His mother and father and all the Vraja-vasis, along with their cows, calves, and bulls, to come under the shelter of Govardhana Hill. Although He was only seven years of age by material calculation, Lord Krishna held up Govardhana Hill for seven days—with the little finger of His left hand. And the residents of Vrindavan found complete satisfaction under Govardhana’s shelter. They experienced no hunger, thirst, or fatigue. In fact, they were rapt in ecstasy, being able to see the beautiful form of Krishna twenty-four hours a day continuously for seven days. And so we learn that one who surrenders to Krishna is not the loser but is the gainer by many times. Now, if some of us have learned to worship demigods, either from our elders or from other association, we need not feel obliged to continue such worship. Here Lord Krishna has shown the example that even if one’s family has worshiped a demigod for many generations, one can stop such worship, because the worship is actually meant for Krishna, and when it is offered to the demigods it is improper. We want to please Krishna and ultimately develop love for Him (prema pumartho mahan). Therefore, as Lord Krishna says, sarva-dharmam parityajya mam ekam saranam vraja—we should give up all other varieties of worship and religious performances and just surrender unto Him. When we come to the shelter of Lord Krishna, to the shelter of Giri Govardhana, we are protected from the onslaughts of material nature and at the same time completely satisfied and happy in Krishna’s association—in Krishna consciousness. By the grace of Krishna, Indra realized his mistake. He realized that Krishna was actually his eternal lord and master and that he had committed a grave offense. So he came to Vrindavan with Surabhi, the mother of the cows, to worship Krishna and beg for His forgiveness. Lord Krishna then explained to Indra that He had purposely crushed his false pride so that he would come back to his proper consciousness, Krishna consciousness. And He ordered Indra to return to his position as the king of heaven, but to be humble and sober. So, this is a lesson to all of us: We should be humble. We should know that whatever position or opulence we have achieved has come to us by the grace of the Lord, Krishna, and should be used for His service and pleasure. And if we are sincere but at the same time happen to have become a little proud and covered by illusion, Krishna will be merciful and humble us. In Srimad-Bhagavatam (10.88.8) He personally states, yasyaham anugrhnami harisye tad-dhanam sanaih: “If I especially favor someone, I gradually deprive him of his wealth.” Of course, we can always remain humble and save Krishna and ourselves the trouble of getting Krishna’s special mercy. In conclusion, I will share with you one thought about leaving the equal weight in gold. Now, here we have quite a large govardhana-sila, and although Tamal Krishna Goswami may not have thought of it at the time, in the end he and I did leave a lot of gold at Govardhana. We bought a property with a palace that belonged to a king, and we have refurbished that facility in order to serve the devotees, serve the brahmans, and feed the Vraja-vasis, especially on occasions such as Govardhana-puja. And that is also the beauty of Krishna consciousness: no one loses. Although we ended up giving more to Govardhana Hill than we had expected at the time we brought the sila here, we don’t feel that we are the losers. Rather, we feel that we have gained hundreds and thousands of times over. And I believe that even now His Holiness Tamal Krishna Goswami, whose puspa-samadhi is at our ashram there, resides at Govardhana Hill. 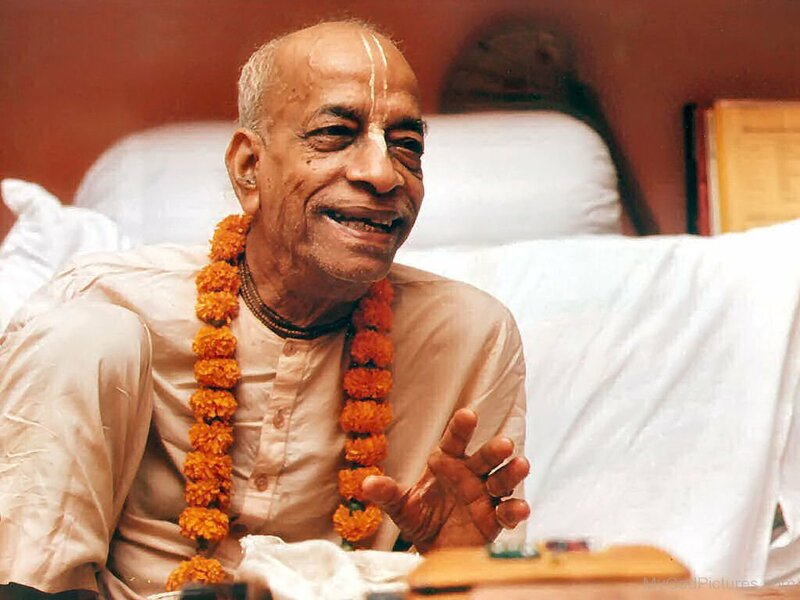 Sri Giri Govardhana ki jaya! His Holiness Tamal Krishna Goswami ki jaya!